Just a few days after our 15th anniversary we went up to the wetlands of Candaba, Pampanga, a place we've often read about for its migratory birds. 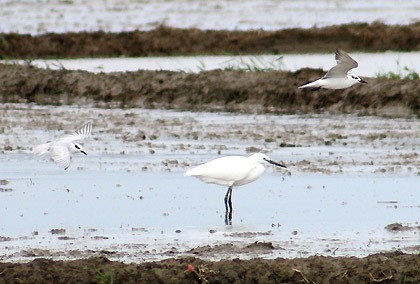 From October to April, thousands of migratory birds visit Candaba and its wetlands - rice fields, swamps, ponds and marshes. To get to Candaba we took the Pulilan exit at the North Luzon Expressway and had to ask around for directions. We didn't prepare much for this trip since we wanted it to be more of an adventure. We were advised to drive up to Baliuag, Bulacan, go past the SM mall there, then make a left under the flyover to get to Candaba. After some more inquiries we took a right turn away from the main road at Bahay Pari in Candaba. By the time we got to the rice fields and marshes the road was much narrower and unpaved. It was hard to imagine how two cars would have fit side-by-side along this track. Fortunately no other car or truck was passing in the opposite direction and it wasn't raining otherwise we would have been stuck in the mud for sure. We quickly encountered different species of birds on the rice fields, many of them unperturbed by the farmers tilling the fields with their carabaos or water buffalos - 3 species of the now familiar egret, sandpipers, whiskered terns and even two purple herons. 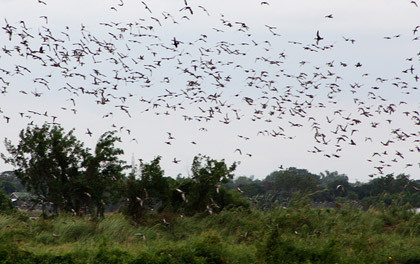 A farmer advised us to go to the property of Mayor Jerry Pelayo where he said the birds were much more numerous. We coninued driving along the track between the rice paddies until we came to the mayor's place - actually a rest house beside what used to be a 100 hectare fishpond. We paid an entrance fee and got three guides to take us to the bird viewing vantage points along the now-marshes, former fish pond (it seems the mayor stopped using the fish ponds and allowed the birds to make them their habitat). We spotted several birds popping in and out of the grasslands: barred rails, banded rails, moorhens and yellow bitterns to name a few. There were solitary purple and gray herons putting on graceful flying exhibitions before making soft landings in the marshes below. 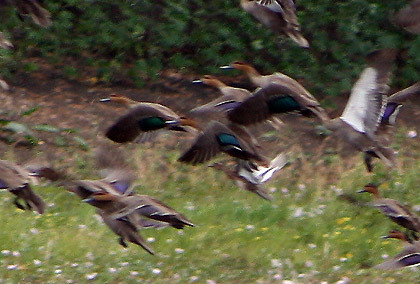 But easily the stars of the show were different species of wild ducks - Philippine mallards, northern pintails, mallards (I was surprised these ducks were here; I thought they were confined to North America) and gadwalls. They filled the sky in loose, disorderly gaggles - showing off as our guides commented. We've never seen such a concentration of different species of birds in a relatively small area before. As with other such places, the Candaba wetlands are not easily accessible. This must be the reason why the birds have called it home. We can only hope these beautiful creatures will still exist in sufficient numbers for future generations to admire.